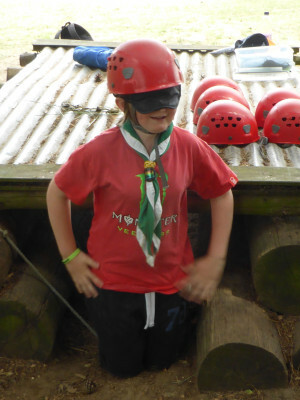 There was lots of fun to be had at the recent Northern Norwich District “World of Adventure” Camp held earlier in July! The amount of work involved in the running of the camp meant that the planning began all the way back in September 2013, when a team was put together to start the preparations for the first Northern Norwich District Camp since 2007. 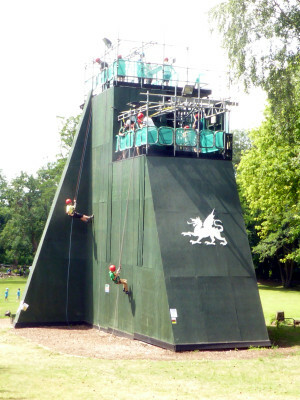 Eaton Vale Activity Centre (EVAC) was the venue for the camp held over the weekend of the 10th to 12th July 2015 and we were pleased that all 13 groups supported the camp with 320 Cubs, Scouts and Explorers camping for the weekend. We were delighted too that 108 Beaver Scouts joined us for a day visit on the Saturday so that they could get a taster of opportunities which they will experience as they move through the other sections. 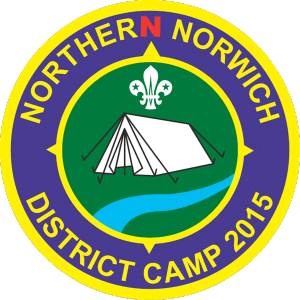 One of the early tasks was to offer every young person in Northern Norwich an opportunity to design the camp badge. Following a difficult selection process we decided to incorporate ideas from three designs created by David Scott, Teri Burton and Peter Savory who each received a voucher to spend on camping equipment or outdoor clothing and at the start of the camp framed badge certificates were presented. The weather for the camp was scorching hot on the Saturday while the Sunday saw us wake to rain showers none of which dampened our spirits although we really could have done without the heavy rain on Sunday afternoon! With more than 30 activities on offer and only a small number being delivered by Eaton Vale staff, we needed a large adult base to run the activities. We are fortunate that, within our adult leaders and supporters, we have a large number of adults who are qualified instructors in a range of adventurous activities who were only too willing to help. We were grateful too that we could call upon scouters from other parts of the county who joined the leadership team to provide valuable expertise in a number of activities. With an “Around the World” theme each Scout Group represented a different country with some theming their food menus around the country they had been allocated. Passports were issued which the young people got stamped as they visited the activities of their choice. 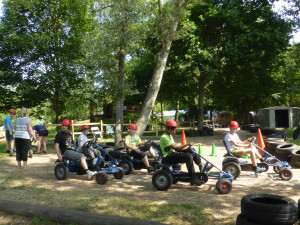 The activities were split into three zones with all young people having 3 hours in each activity zone so that they could choose which activities they would like to do. This worked brilliantly. Among the activities on offer were: air rifle shooting, archery, catapults, climbing, abseiling, crate stacking, kayaking, rafting, bell boating, backwoods cooking, bush craft skills, high ropes activities, mountain biking and teambuilding activities. The evening activities included camp fires and a mini cinema with popcorn kindly supplied by Odeon, Norwich. To close, the entire camp joined together at the front of EVAC, which was a great sight. Various certificates of adult service were presented including a “50 years” service award to Trevor Orford who was given the honour of closing the camp. I would like to place on record my appreciation for the unending commitment of the camp team who worked tirelessly over the past six months to deliver a fantastic experience and all the adults who supported the activities and their Group’s to enable the campers to have a memorable experience. There are a great deal many more great photos from the weekend showing all of the activities on offer and just a snapshot of the fun that was had over in the photo gallery.